Serious Games (SGs) have a lot of potential in education, possibly making learning more engaging and satisfying. Adaptive Games strive to keep the challenges presented by the game balanced with the player’s abilities, as to keep the player in the “flow” state. We have used a Service-Oriented Architecture (SOA) approach to develop a simple adaptive SG for teaching basic elements of probability to high school and entry-level university students, called The Journey. The game performs continuously the updating of a user model with the competences of the student and presents the new challenges according to the student’s current level. 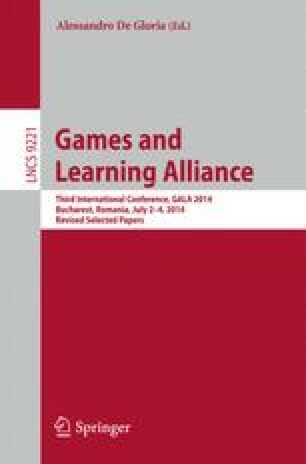 This paper presents details of the educational aspects of the game, as well as of its implementation. It also presents a preliminary validation study and discusses future work. This work has been partially funded by the EC, through the GALA EU Network of Excellence in Serious Games (FP7-ICT-2009-5-258169). This work was supported in part by the Erasmus Mundus Joint Doctorate in Interactive and Cognitive Environments, which is funded by the EACEA Agency of the European Commission under EMJD ICE FPA n 2010-0012. This work is partially supported by the European Commission (EC) under the Information Society Technology priority of the 7th Framework Programme for Research and Development under contract no 258114 NEXT-TELL.